There were two important reports on the U.S. economy released this morning. 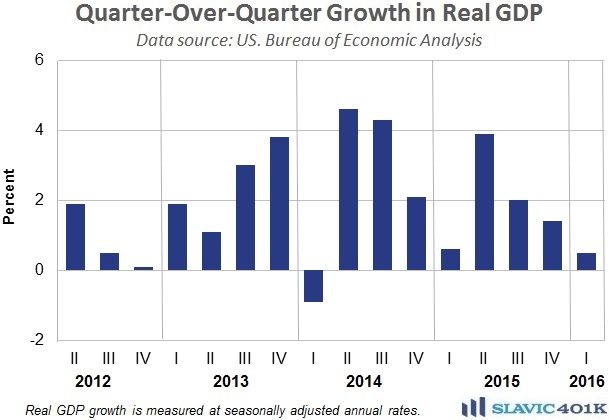 First, data from the Bureau of Economic Analysis (BEA) showed that U.S. gross domestic product (GDP) growth slowed significantly in the first quarter of 2016. Specifically, real GDP, which measures the value of the production of goods and services in America adjusted for price changes (inflation), increased at an annual rate of 0.5 percent in Q1. That is below the 0.7 percent consensus forecast, much slower than the already sluggish 1.4 percent growth seen in Q4 2015, and the weakest quarterly growth for real GDP in two years. The deceleration in the first quarter was due largely to a continuation of inventory drawdowns, a downturn in federal government spending, an upturn in imports, a decrease in nonresidential fixed investment, and a slowdown in personal consumption expenditures (PCE), i.e. consumer spending. A weather-related spike in housing/utilities services consumption helped keep GDP growth positive in Q1. 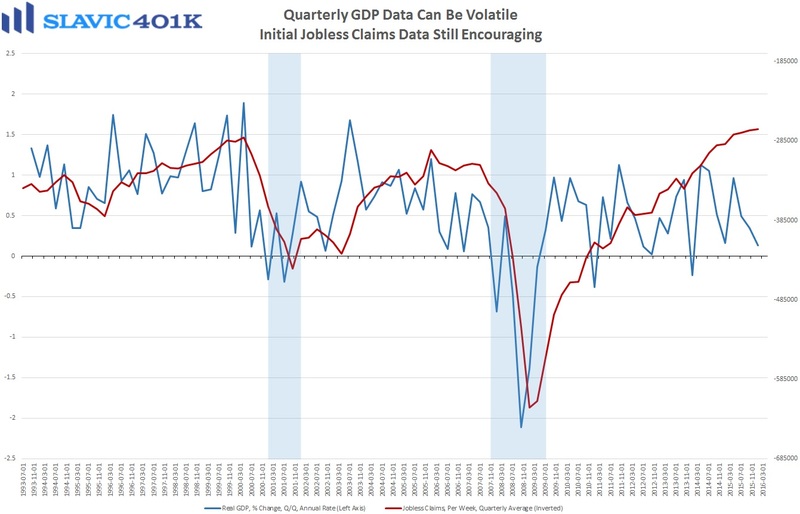 Overall this was a disappointing report but many economists are hopeful that the pattern seen in the past few years of weak Q1 GDP growth being offset by a rebound in subsequent quarters will continue to hold true in 2016. 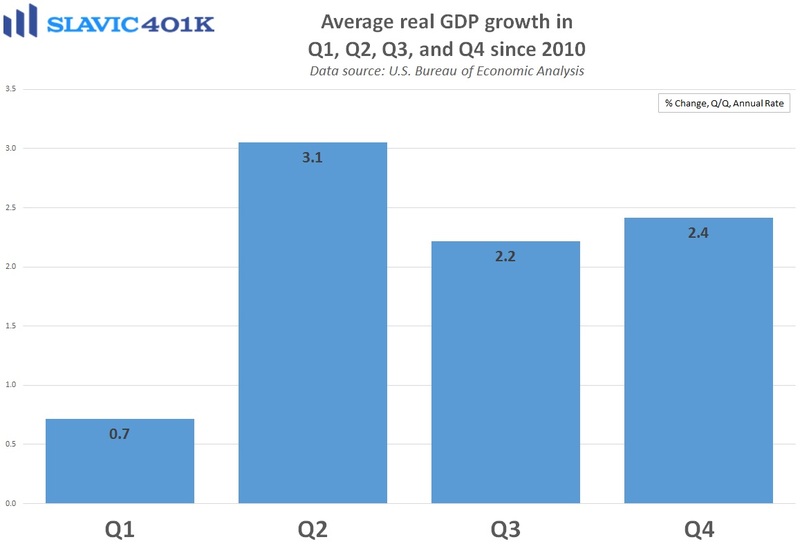 Moreover, this is the advance (first) estimate of Q1 GDP growth, which means that large revisions, up or down, could be seen over the next few months. 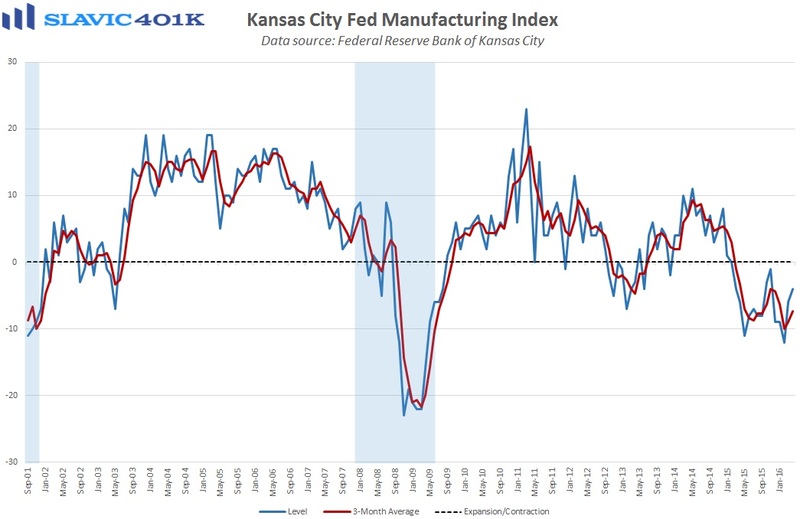 Elsewhere, the Federal Reserve Bank of Kansas City’s composite manufacturing index lifted from -6.0 in March to -4.0 in April, the highest reading since November. Although this is the 14th negative (contractionary) reading in a row for this metric, surveyed managers’ expectations for future activity increased to the best level of the year. This is also the final report on regional manufacturing activity released for the month of April. 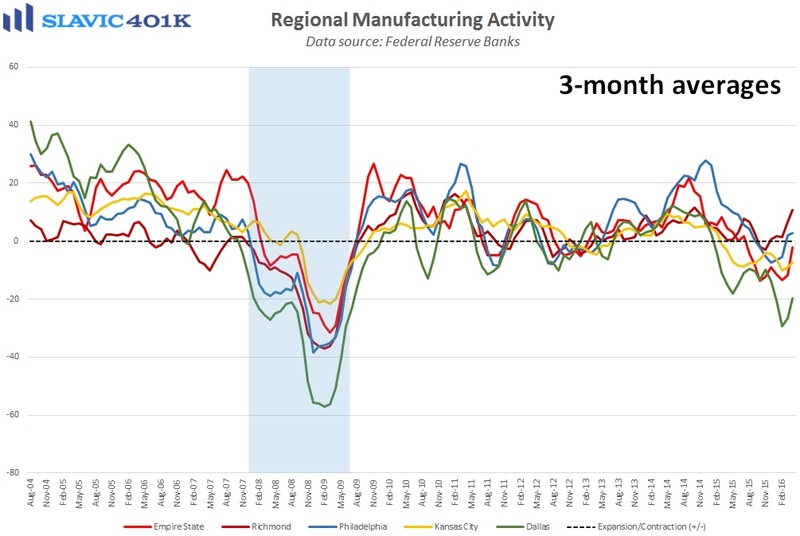 With two of the reports improving and three softening, it is clearly still too early to tell whether or not the “industrial recession” in America that started last summer has truly ended.